In memory of my father, Robert T. Struck, April 26, 1921 – April 21, 2017. Reprinted from May 4, 2015. It took me many years to learn the greatest lessons of leadership from my father. They were subtle. Dad has his PhD in Chemical Engineering. He is a brilliant scientist, having developed a lubricant for the Norden Bomb site when he was just out of college at the start of WWII; he also held 12 patents for his work on the gasification of coal (yes, I am bragging). He is an introvert. That simply meant that what you might learn from my dad required that you had to be ‘awake’ and ‘aware’ around my father as the ‘nuggets’ of wisdom could show up at any moment. Dad is like a mighty oak, his Tap Roots go deep. It is from the Tap Root of Character that my greatest lessons came. Dad could be the poster child for, what Tom Brokaw labeled, “The Greatest Generation.” He never called attention to himself. He went about his responsibilities as if to say, “This is what I’m supposed to do.” No matter how difficult things became, Dad did what was necessary. If my father makes a commitment, he keeps it. If he tells you something to be true, it is. I can’t remember him speaking badly about anyone. He is a man of few words. When he talks he has something to say and people listen. He is humble. He gives his money freely. He is frugal. He used to tell me, “Jim, if you want to have money, save 10% of everything you earn. Pay cash for things. If you can’t afford it, don’t buy it.” (My generation has done real well with that! Or not!) He is a Christian. He has great wit. He’s a Pirates fan. He didn’t ‘tell’ me as much as he showed me…volumes…of what it meant to be honorable, to take care of what you own, to be trustworthy, to do what you say you are going to do, how less is more, how ‘leading’ from a position of personal strength rather than words is more lasting and meaningful. I suppose this is normal, but for much of my life I didn’t feel like I measured up when it came to the Tap Root of Character. Then I realized it wasn’t about perfection, and it wasn’t about measuring up to him – it was about measuring up to me, and who I was created to be. Often, as leaders and as people, we spend our early years ‘searching’ for who we were created to be. It is during those times that it is most helpful to have someone(s) show us the ‘right’ path until we find our own. Remember that and look for that someone when you’re young, and be that someone as you gain experience. 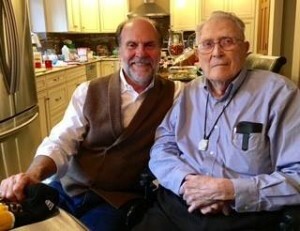 For 64 years my father has showed me a path of what it meant to be a man, a father, a Christian. Much of who I am in my Tap Root of Character came from watching my father. He would tell you that I have ‘evolved’ beyond him. In some ways he is right, and that is how it should be. In other ways, he does it better. It isn’t about perfection. For many years there was a growing trend of fathers being ‘absent.’ I hope that trend is reversing. Dad was ‘present’ in very important ways for me, as was my mother. I was blessed to be loved and cared for. When we are loved and cared for our response is to love and care for others. It is what we do as leaders, as people. It is the greatest way to honor those who showed us an important ‘path’ in our lives as we were creating our own. Don’t worry about your ‘legacy.’ Live the best version of yourself every day and your legacy will take care of itself.